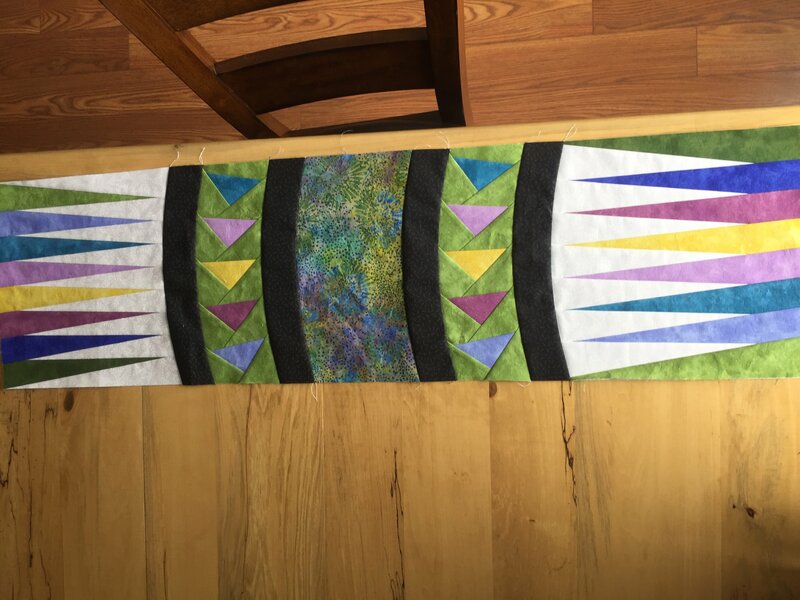 This past week, I took a 3 day class at my local quilt shop, and we learned her paper piecing technique. This is 1/3 of what will be the complete quilt. The next two pieces will complete the “wave” with the flying geese. I’m trying to keep at it now that I’m home so that I don’t forget what I learned! I will post a picture when I see them all together. Be sure to post when it's done. You're on a roll so keep going while it's still fresh. Good choice of color. Great start. That will be a very pretty quilt when done. Once you learn Judy's techniques you can do any of her patterns. Fine start and I can’t wait to see it finished! Off to a good start, it will be beautiful. Looks great so far! Your points look perfect-I always have trouble with them. Love your colors! I will be anxious to see the finish. JN patterns are a challenge to rise to. This is one that I have not seen before. I agree it's a good idea to keep going to keep those ideas fresh from your class. Can't wait to see it progress! Colors are refreshing and keep us posted on your progress. YAY! So far...you're smart to keep it going while you have the instruction fresh in your mind. Vibrant and beautiful colors! Yes, it's a good idea to keep at it. I am usually sorry when I put a project down for too long and have to strain my brain to remember what I was doing. Your points are perfect. I look forward to seeing your next post on this quilt. Great start. I love your color choices.